THIS SPECIAL ONE-SHOT IS DEDICATED TO THE LATE JOSH MEDORS AND HIS FAMILY - A SPECIAL STORY FOR A SPECIAL FRIEND. On February 13, 1968, a passenger train derails in Streiner, Mississippi when a rotting mass of the living dead blocks the tracks. Hundreds are killed and the few desperate survivors are forced to hole up as best they can within the confines of the small rural town. 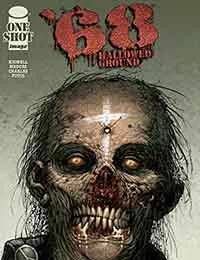 Trapped in a tiny church, two soldiers fresh from the killing fields of Vietnam must do their best to defend a handful of civilians from the oncoming horde of flesh-eating cadavers. While a man named for the devil holds the barricaded sanctuary, a sniper in the belfry above practices his deadly trade, slaying the ''disciples'' of hell from a hundred yards away. Together, they must brave the living nightmares of 1968 and fight to hold their tiny piece of HALLOWED GROUND.